To strengthen the community and devote service through reciprocal exchange. Need Tech Support? Let us know if you would like a hands-on tutorial for hOurWorld, or individual help creating offers, requests, groups, your profile, or user settings. Governance Circle Want to help us develop our new mission, vision and goals? A small group is meeting monthly to establish some structure and process for shared governance, clarify/adopt policies, develop leadership capacity and create plans for growing the size and services of our Timebank. Open to members who are passionate about their vision for time banking in Santa Barbara. Contact Sarah or Johnny if you are interested. We need good ideas and energy to implement events and 1-on-1 exchanges to build the membership and get quiet members off the sidelines. Some folks need a mentor, a friend, or just help using this website, in order to be active. Can you help? Would you like to help but feel you don't know enough yourself? Let us know and we'll get you up to speed. 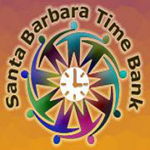 Time Banking means every time you spend an hour doing something for someone else in the Greater Santa Barbara community, that hour goes into your Time Bank account as one Time Dollar. You can spend that Time Dollar by having another Timebanker do something for you. Time Bank members use this simple Internet tool to list the services they want to give and receive. The website brings Time Bank members together, facilitates the exchange of services, and keeps track of hours exchanged. Santa Barbara Time Bank members meet each other in person and set up service exchanges at our monthly potlucks. This is a fun time to meet members of the community and discover the services that are being offered by others. All service hours are equal. So here, no one's time is any more valuable or less valuable than other individuals. Time banking puts us all on equal footing; this values humanity; this values individual effort, and fosters team work and community building. If you’re drawn to work together in community then time banking is for you. We intend to strengthen the bonds of our community by making it easier to know the needs of our neighbors and to give and receive service. True wealth is in the relationships between people, and interdependence is a cause for celebration. To really express Love, we seek to exchange our most precious asset - time, to make the community stronger, more resilient, and more enjoyable for everyone. Receiving service is as valuable as giving - every time you receive an hour of service, you allow Time Dollars (TD$) to be earned. The Santa Barbara Time Bank is egalitarian - anyone on the South Coast, Santa Ynez Valley, and western Ventura County can join. We come from many different walks of life and belief systems. We honor each other without necessarily agreeing. We are part of the transformation from the linear, disconnected, competitive system to the emerging interdependent and cooperative way. It's free, and you get 2 Time Dollars just for joining. While anyone can join, because we operate on trust, we do a little screening process before you have rights to access the web-based exchange and time dollar (TD$) accounting system. We'd like to meet you face-to-face, or have two members vouch for you. Look for your "New Member Application for..." confirmation email. (It could be in your junk/spam folder). You are now a registered "New applicant." It will say it's from the "Santa Barbara Time Bank" and come from admin@hourworld.org. 1) Look at the list of Coordinators on the bottom of the right column. ** If you already know a coordinator, state who and how you know them. 3) Request a meeting with Sarah Dear, our new member coordinator. This meeting can happen either in person, over the phone or virtually. While you are waiting, you can view the orientation video (see Notices above right. And right above that is the link to the Member guide you can review. It may take a week before we get back to you to confirm how we plan to approve you. If we don't, use the Contact Us at the top of the page to get our attention a second time. Once you've registered, and we've gotten to know you one way or another, we will approve your membership within a few days. And we will credit you 2 TD$ as a welcome gift. Now you will be able to access the TimeBank to indicate what you need, how you would like to earn TB$, and see if see what services are offered by other timebankers. You can also build out your profile. We ask that you add your photo and some info to the "About You" section of the profile so other members get a snapshot of who you are and what you'd like to give or get help with. hOurWorld has many tools to help you learn how to use our online accounting platform. Check out this 8 minute member orientation video. While hOurWorld is fairly user friendly, once you login, (and have changed your password, and checked your profile, contact info, statement, offers, and requests) we recommend you read the notes and tips we've compiled, by clicking on "Notices" in the menu bar. Now anyone can send announcements to anyone, any group, or all active members. No need to use Facebook to try and get your word out about what you need. The announcements show up on other member's home page right away! And anyone can create group for others to join. We've set up a bunch of Neighborhoods, that all start with the word Neighborhood. Please feel free to add if you don't see the ones you want. Mobile Apps. Developmental Android and iOS versions of mobile apps are now available thru this page. Your Name here - Contact us with how you are willing to help. hOurworld: 44,331 MEMBERS. 2,309,653 HOURS EXCHANGED.